Follow the instructions to the rice you will be using in this dish. Remove from the heat keeping covered and let stand until completely cool, at least 1 hour. Separate grains with a fork. Take each piece of tuna and drizzle olive oil and season with salt and pepper on each side. 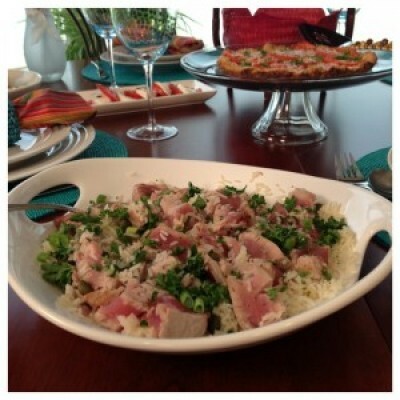 In a large serving bowl add rice, tuna, lemon juice or white wine vinegar, capers, green scallions, parsley, basil then combine using 2 large spoons. Taste for additional salt or pepper. Drizzle with your best olive oil, garnish with fresh herbs and let your guests serve themselves.